Reads R to L (Japanese Style). A poetic tale of a young boy's overactive imagination. Nine-year-old Yuki Tachibana lives in two worlds. In one world, he is a loner ridiculed by his classmated and reprimanded by his teachers for telling stories of supernatural beings that only he can see. 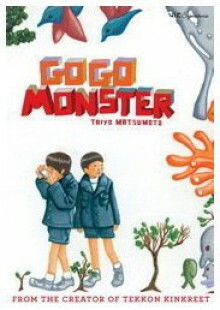 In the other worlds, the super natural beings vie for power with malevolent spirits who bring chaos into the school, the stuents lives and nature itself.GoGo Monster is a nuanced tale of a young boy and his overly active imagination. Nine-year-old Yuki Tachibana lives in two worlds. In one world, he is a loner ridiculed by his classmated and reprimanded by his teachers for telling stories of supernatural beings that only he can see. In the other worlds, the super natural beings vie for power with malevolent spirits who bring chaos into the school, the stduents lives and nature itself.